I carry this quote with me on a daily basis for a very simple reason: to remind myself to seek the “we don’t know what we don’t know” as often as I can. The unknown unknowns, as the Secretary termed them, are where, I believe, we can really grow, we can really solve problems, and we can really bring about change. That is why, during my month long stint in the District of Columbia with the American Veterinary Medical Association, I have sought to meet with organizations and individuals who are likely to share vastly different outlooks, perspectives, opinions, and thoughts than my own. Take tackling the ever-growing problem of veterinary student loan debt. The obvious experts on this issue work for the American Veterinary Medical Association (AVMA) and the American Association of Veterinary Medical Colleges (AAVMC). It is their very job to know this issue, brainstorm solutions, and confront this debt head on. But what if I told you that I had a very fruitful and eye-opening discussion with National Cattlemen’s Beef Association (NCBA)? That’s right, the association which represents beef producers across the United States. What I took away from that meeting with a vastly different perspective, one from outside the hallowed halls of academia and one that has really changed my ideas about how we can solve the debt, as we veterinary students put it. Take humane slaughter. One would likely predict that I would meet with an animal welfare group, but I also met with the veterinarians who work with abattoirs on a daily basis. To ensure that food animals – whether you are a carnivore, omnivore, vegetarian, or strict vegan – are treated humanely prior to and during slaughter, we really need to understand the concept of humane slaughter from all sides, across the spectrum, and from vastly different perspectives. It does the animals little good if all of the stakeholders in humane slaughter do not speak with each other. 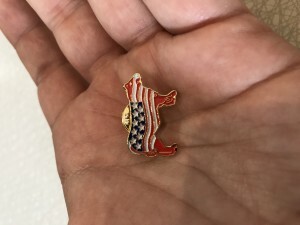 After my meeting with the National Cattlemen’s Beef Association, I was presented with a star-spangled cattle lapel pin. Now, if you know me, you can appreciate that I love cows and I am dedicated to the future of this nation, so the pin suits me well. However, I wear the pin now for an additional reason: sometimes, you find answers to questions in places you never thought probable or possible.